The first home is in the flesh; the first place where most humans feel at home is embedded in their mother’s body, slowly growing aware of their own flesh and blood within hers. It follows that the most terrifying displacement, the most savage experience of being homeless, would involve being disembodied, in some elemental way. Manjula Padmanabhan’s The Island of Lost Girls is a sequel to her unsettling 2008 novel, Escape. It is not so much a sequel as an unflinching continuation of the idea she explored in Escape: what kind of world would we live in if it was considered acceptable to think of women as Vermin, and to exterminate them (and Vermin-loving men) as a matter of course? The Island of Lost Girls takes three characters from the first book, Meiji, her father/uncle Youngest and the General, into a more complex universe. One of Manjula Padmanabhan’s gifts is a kind of writerly precognition. She invented the Forbidden Country, Meiji’s homeland, in the early 2000s, before the mainstream awareness in India of the number of women who are routinely raped to death, strung up from the limbs of trees, burned as witches, or ripped from the womb as unwanted foetuses before they were even born. “…So the first thing they did when they came to power was to force all the men to destroy all the women of our region. All the women. The women who resisted were hunted down, dragged into the streets and butchered. Grenades were inserted into their private parts. Their entrails were hung from the trees like garlands…” Meiji was born in secret, kept alive by Youngest and her brothers, and grew up unaware of what being a woman might signify. In Island, the Forbidden Country is outlawed. It’s been two decades since eco-anarchists blew up the Suez Canal and poisoned the Red Sea; nations have been replaced by the Whole World Union, and the planet is split into four independent enclaves. The enclaves do not communicate between themselves; dominating the centre of the planet is The Zone – “a giant arena for a continuous, savage and immensely popular cycle of war games”. The reader sees this world through Youngest’s eyes – rich, fascinating, so intensely imagined that it’s easy to visualise Youngest’s encounter with an immigration officer in hologram form, mechanical toys that screech at pedestrians, “begging to be bought, to be tasted”, a world where clones, transies, feems and drones perform elaborate transactions. 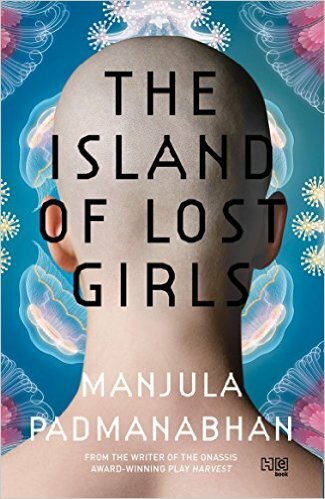 The Island is a place where wounded girls are brought to heal, with the ambiguous blessing of Memrase, but it is also a highly pragmatic utopia, subject to the fluctuations of change – and to the pressures of its own peculiar biology. This is where Meiji grapples with hard questions of identity: what does it mean to be a woman, instead of just a “person”, and what does it mean to have a woman’s body if you share none of the cultural experiences of “womanhood”? One reason why Island is so gripping is that it deals with multiple questions of identity, without growing didactic. Gender shapes women and transies, in particular; in a brilliant section on drones, and another on cetaceans, Ms Padmanabhan subtly introduces hard questions about sentience versus consciousness. Can an animal feel complex emotions? Could an artificial intelligence programmed only to serve have feelings of compassion, or fear? Though both Escape and Island are set in alternate futures, they present some of the most disturbing analyses of masculinity, gender fluidity, trans identities and gender hierarchies you’ll find in contemporary fiction. The only protagonist who is certain of his gender identity is the Vermin-hating General, drawn from equal parts of Amon Goeth and old-school Chinese warlord. He is so sure that he is right, that women are not human, and that worlds where they are treated as human are beneath contempt. His certainties hold a harsh mirror up to many in our own times. Most speculative fiction novels slice neatly into either/or categories: utopia, or dystopia. But Escape and Island straddle both worlds. Sometimes what might be deeply desired, or considered utopian, is just as unsettling as any of the grim cruelties perpetrated by the General. If Island were only a novel of ideas, it would be a startling but slightly flat read. But it is also visually seductive, just familiar enough to fit with our worries over climate change and the ritualised conversion of war and horror into entertainment, and also satisfyingly alien in its portrayal of a sea-world where you might ride as a parasite in the body of your vehicle. In the last few decades, speculative fiction has been shifting ever so slightly away from the US and the UK, with writers imagining alternate worlds inflected with Nigerian mythology, or, like Ken Liu, dreaming up SilkPunk instead of Steampunk. Manjula Padmanabhan’s vivid, sometimes cynically violent, trip through zones, enclaves, islands and water-worlds takes up where Ursula K Le Guin left off, placing gender at the heart of both dystopia and her protagonists’ tentative dreams of utopia. She offers no happy endings, only precarious ones, but take the ride anyway. It’s wilder, crueller and more hallucinatory than any other novel out there this year.